I decided to look at the Monty Hall problem through the eyes of Bayes Theorem and see if I could arrive at the right answer. After all, this is exactly the kind of situation that Bayesian reasoning should help us resolve – there is a known prior probability, some new evidence is presented, and we need to calculate the posterior probability. Now I apply Bayes Theorem……………. What we are looking for is P(H | E) OR P(Hcbmd | Egbad) OR to put it in words, what is the probability that there is a car behind my door given new evidence that has revealed a goat behind another door. 2. This also implies that before any new evidence was observed, the prior probability that the car was NOT behind my door (meaning my hypothesis is false) = 1 – P(Hcbmd) = 2/3. So, P(~H) which I write as P(~Hcbmd) = 2/3. 3. Now for the terms P(E | H) and P(E | ~H) in the formula above. Here is where it gets a little tricky. If you scroll up to the statement of the problem, you’ll notice that the gameshow host knows whats behind the doors. It would be senseless for the host to open the door that reveals the car, and so he would therefore ALWAYS open a door that was hiding a goat whether or not my door was hiding a car or a goat. So irrespective whether Hcbmd were true or false, P(Egbad) would always be true. So P(Egbad | Hcbmd) = 1 and P(Egbad | ~Hcbmd) = 1. This calculation can be verified redoing the problem and modifying our our hypothesis H as the probability that there is a goat behind my door (given the new evidence). This should evaluate to 0.66 or a 66.6% chance that I will win a goat if I stick to my original choice of door. 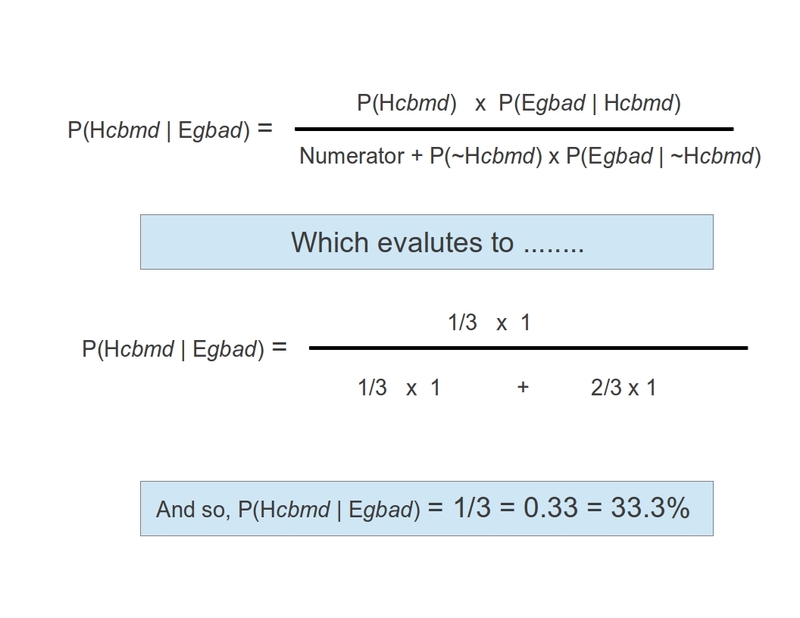 If you are learning Bayes Theorem, this is good exercise to try out. And thus Bayes Theorem has corrected solved the Monty Hall problem. Just another useful application of the most powerful force in the universe. This entry was posted in Exploring Bayes Theorem and tagged bayes solution to monty hall, Bayes Theorem, conditional probability, Monty Hall, solution, solved, tutorial by vu2aeo. Bookmark the permalink. If the hypothesis was instead “There is a car behind the door Monty didn’t open” ,then you still get 1/3 using your analysis. That is an interesting proposition but I disagree with your conclusion. Suppose I choose Door No. 3 and Monty opens Door No. 2 to reveal a goat. P(E|H) = Probability that Monty would open Door No. 2 given that there was a car behind Door No.1. Since Monty would have no choice really since Monty can’t open Door No. 3 (My Door) and he must keep the car’s location hidden, he would have to open Door No.2. So P(E|H) = 1. The last term is the trickiest…. 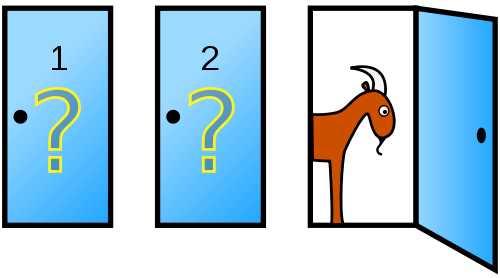 P(E|~H) = The probability that Monty would open Door 2 (and reveal a goat) given that there was a goat behind Door 1. So if ~H were true, option (a) has a probability of 0 and option (b) has a probability of 0.25 for Door No.1 and 0.25 for Door No.2. Plugging these into the bayes equation….P(H|E) = (0.33 * 1)/(0.33 * 1 + 0.66 * 0.25) = 0.66667, NOT 0.33 as you concluded. I agree with your response, and if your initial solution had been derived using the same example you would have ended up with 1/3 (as you did): P(H|E) = (0.33 * 1/2)/(0.33*1 + 0.66*0.25) = 1/3. I think using a specific example (e.g Pick Door3, Monty opens Door2) to calculate a Bayes solution is a better explanation than the generic one you gave which basically just said – (prior) probabilty car is behind my door = 1/3, probability Monty opens a goat door = 1. We know from the rules that the probability Monty will reveal a goat is 1. Yes, I concur with your opinion…a more specific example would have been much clearer. 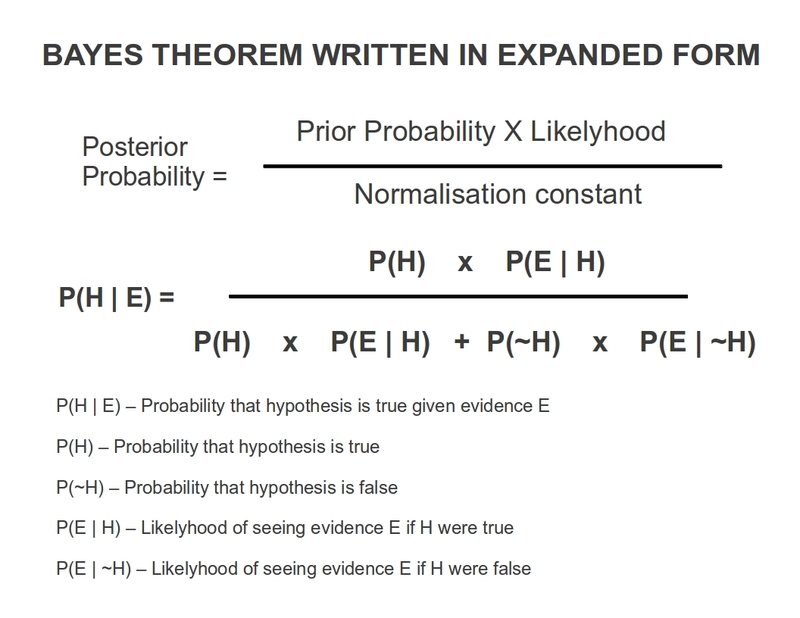 Very nice discussion, though….made my understanding of Bayes Theorem a little more robust! Thanks.